Happy New Year! It’s time to turn the calendar over and begin marking off the days for 2018. We’re starting January with the first five verses of Genesis, hopping on the speeding narrative train that is Mark with Jesus’ baptism, and spending some time in Acts watching Paul upgrade the Ephesians operating system from the baptism of John to the baptism of ☧. Only God knows what’s coming down the road for 2018 and while we have our hopes and fears, one thing we know for certain: God is already there and God is waiting for us. Let’s go explore some ways to usher in this season with illustrations and special effects. The creation stories in Genesis are so familiar that it is a bit jarring to stop at the end of the first day. The connection for the other two passages is the Spirit (Acts) moving over the waters (Mark), so this is the reason the other six days are left back stage. But, there is nothing to prevent you from using the entire account if you desire. We had a lot of information but decided to stick to EYE, MATH, MUSIC, and NATURE smart. As usual, to illustrate using EYE smart, go to Google and find art work about the creation. I found a lot of it covering many centuries, countries, and styles. I gravitated toward the colorful and we have links to some of what I found down below. You could devote a LOT of time to this particular intelligence for this passage! The special effect could include children and make a memorable experience for them. We break out equations and sine waves and pendulums for MATH smart. MUSIC smart is as well represented as EYE for this passage and we have links to music and poetry for you to consider. NATURE smart could be a lot of fun and utilize people in your congregation in a meaningful way, so go check it out on the worksheet! Also: sine wave tone generator. Sfx: set up a pendulum = something like this where the system has potential energy that is released into kinetic energy. The Creation from God’s Trombones by James Weldon Johnson. Imagine Paul had a smartphone and was communicating with the Ephesians the way some of us might these days. 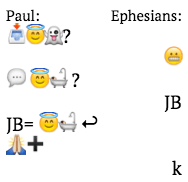 What would this exchange look like as emojis? Paul was surprised the Ephesians had only experienced the baptism of John and quickly went about instructing and performing baptism in Jesus’ name. We use a flow chart to demonstrate the conversation and suggest illustrating repentance using scales for MATH smart. This particular illustration could be done in conjunction with BODY smart, too. Other options for BODY include a book called The Spark of Life (linked below) and incorporating the laying on of hands in the worship service. We have some ideas how that could be done. David has a story that you may use to illustrate Paul’s surprise in PEOPLE smart. We’ve also linked to a story that comes from a Native American narrative. We suggest using the Reaffirmation of the Baptismal Covenant for a special effect. This includes laying on hands which connects with BODY smart. 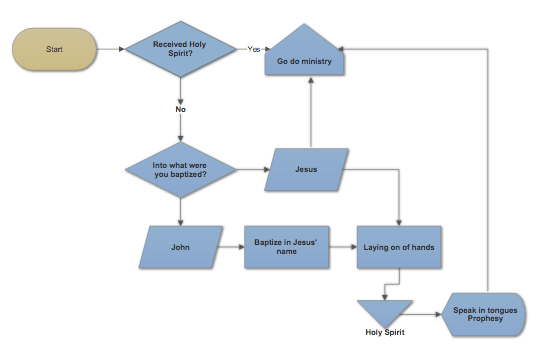 Paul’s response to the Ephesians can be graphed with a flowchart! Use the liturgy for the Renewal of the Baptismal Covenant in the Book of Common Worship. Year B is Mark’s turn to tell the tale of Jesus’ baptism. If you want to really excite the WORD smart among your people, compare the Synoptic versions of this story. How do Luke and Matthew differ and why? It could be quite delightful for them! We decided to go with other smarts for this passage, beginning in BODY by describing or inviting your folks to “feel” water on their bodies. For a special effect, bring in bath equipment, maybe setting up a tub to wash in while you talk. MUSIC is once again filled with song and poetry; see the links! David was captivated by the thought of what the heavens may have looked like as Jesus came up out of the river so in NATURE smart, look for images of celestial phenomenon. Don’t forget the August 2017 eclipse! And for SELF smart, read or copy and distribute the quotation on the worksheet and invite people to do the self meditation we provided. 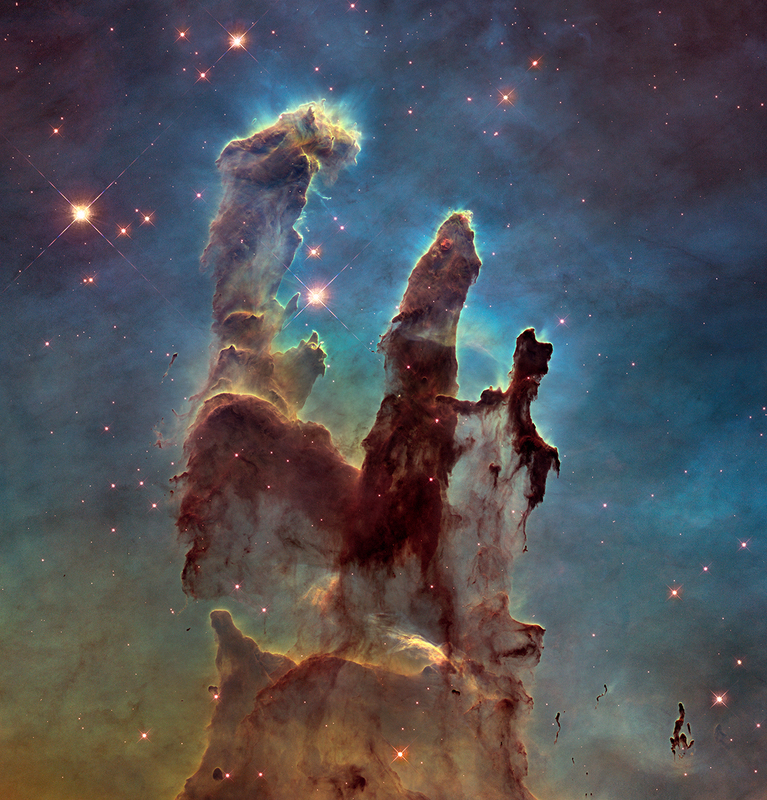 What is the most interesting celestial phenomenon you have seen? Image Credit: Copyright: madmaxer / 123RF Stock Photo. Used by permission.